May. 9, 2014 1:00 p.m.
Maskwacis Cultural College held the “First Nations Library Service Without Borders” conference on April 17th. The conference was graciously hosted by Maskwacis Cultural College President, Patricia Goodwill-Littlechild, and Librarian, Manisha Khatarpal, who did much of the organizing. The guest speaker, Dr. Loriene Roy, is from Austin, Texas, where she teaches classes in Library Science to students working toward advanced degrees. She also teaches the same courses in Hawaii. In addition, her interest in helping with the development of libraries for Indigenous peoples has taken her to many other parts of the globe. 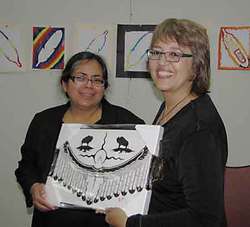 As a registered Aboriginal American, she applied a First Nations perspective to her talk. In the morning, she addressed the intersections of culture, protocol, worldview, and ethics; Indigenous fulfilment; a spectrum of public services; and developing public services. In the afternoon, she went on to discuss the practical issues of how to proceed with naming; developing the vision, mission, goals, and objectives; building collections; signage; creating resources; incorporating protocol; and creating programs. She excelled at teaching the principles through examples. The afternoon concluded with a panel on “Diversity of Indigenous Communities” which was moderated by Patricia Goodwill-Littlechild and had presenters Dr. Yun Ghimn, Wayne Reindeer and student Christopher Raine. Dr. Yun's presentation from the perspective of a Sociology instructor was interesting, as was Wayne Reindeer's journey from the Northwest Territories, to residential school, to some rough times, to some studies in Education, to helping native students in a variety of settings. However, it was the Maskwacis Cultural College Student, Christopher Raine, who brought well researched and detailed information to support his observations and recommendations. He concluded by singing a song that fit his views, accompanying himself on his guitar. All indicated the important role that the library has in the college.